You have a very good memory. Your description of the drop and what you did is very real. The 508th was scheduled to drop between the Douve and Merderet rivers. The 508th was south, below, as we looked at it on the maps, of the 507th. Considerable mixup must have occurred because I encountered some 508th east of the Douve River, that is, on the Ste.-Mere-Eglise side, during the night. But you seemed to have landed in just about the right place. You probably landed not far from the main road from Ste.-Mere-Eglise to Picauville to St.-Sauveur-le-Vicomte. Genera] Falley had a command post in a chateau not far from the road. After I landed I had a long fire fight with an attacking German force. The story is in On To Berlin, which is now out in paperback. it should also be in your local library. I waded the Merderet River with about 100 troopers and joined the 505 at La Fiere. You apparently joined me there. We were having a hard fight at La Fiere and two battalion commanders had been killed. I decided to go down to Chef-du-Pont, which was about a 5-mile walk. You accompanied me down there. The purpose of going there was to seize the causeway. Your outfit got it done. We forced the crossing at La Fiere on about the morning of D+4, the actual date is in my book. We then took up the attack toward St. Sauveur. I talked to Lieutenant Brannen about killing General Falley. 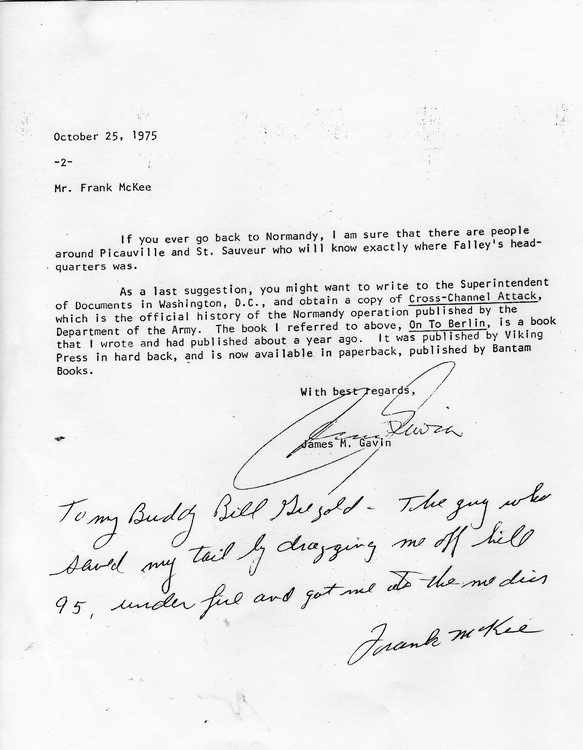 Falley's car was coming down the road from the direction of Picauville when a 508 trooper fired a burst of fire through the windshield. The car went into the ditch and the door swung open. Falley was halfway out and jumped out of the car and he was in a prone position on the road. He had taken out his pistol and it had gotten away from him and slithered across the road. He kept saying to Lt. Brannen in English, "Don't shoot, don't shoot," but he kept reaching for the pistol, so Brannen shot him. But your description of the 508th action is very accurate. After you crossed the Douve at St.-Savuveur-le-Vicomte, you went on to 131 and then to Hill 95- Unfortunately, you were hit on just about our last day in Normandy. I was on 95 for a bit and the Germans were stiffening their resistance through the town at the south of the hill, La-Haye-du Puits. It has been good to hear from you. I hope that all goes well with you. 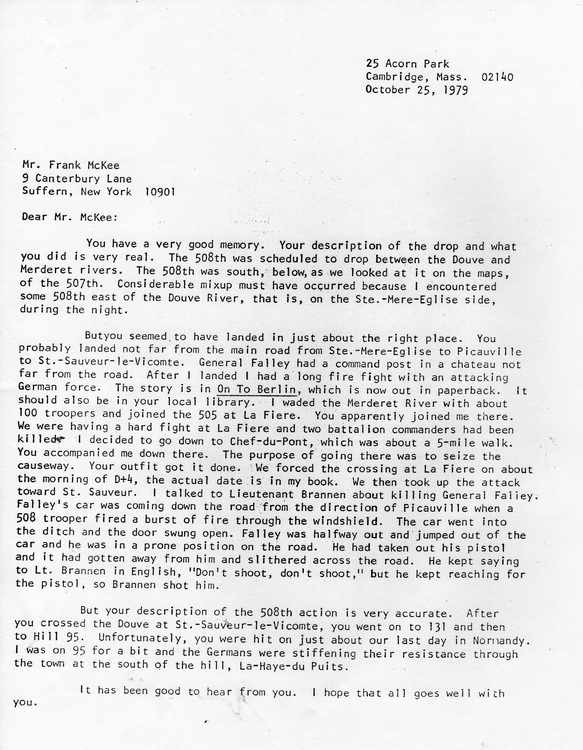 If you ever go back to Normandy, I am sure that there are people around Picauville and St. Sauveur who will know exactly where Falley's head­quarters was. As a last suggestion, you might want to write to the Superintendent of Documents in Washington, D.C., and obtain a copy of Cross-Channel Attack, which is the official history of the Normandy operation published by the Department of the Army. The book I referred to above, On To Berlin, is a book that I wrote and had published about a year ago. It was published by Viking Press in hard back, and is now available in paperback, published by Bantam Books. "To my buddy Bill Giegold - The guy who saved my tail by dragging me off hill 95, under fire and got me to the medics." 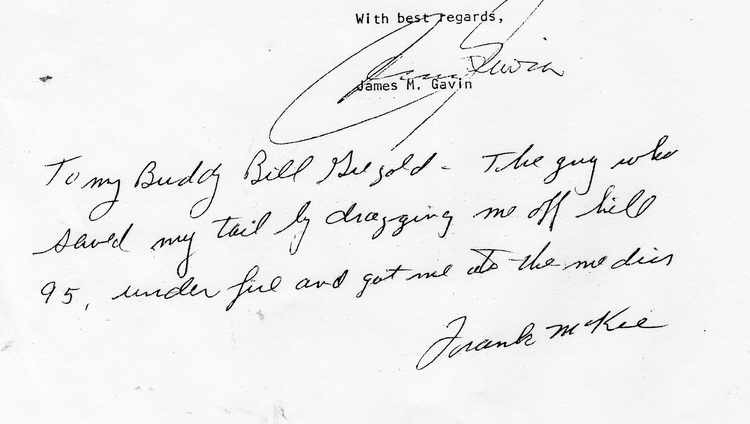 Apparently Frank sent this copy of Gavin's letter to Bill Giegold.